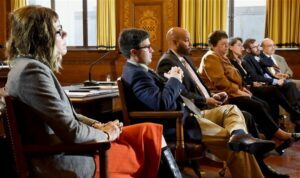 Pittsburgh City Council forged ahead Monday with several high-profile measures, including plans to add several hundred more body-worn cameras for city police. Council members also supported a resolution on climate change, passed a streets policy and addressed an affordable housing proposal that will return for discussion next week. “The market will not build affordable housing,” said Councilman Ricky Burgess, an outspoken advocate for the proposed Housing Opportunity Fund. Rev. Burgess aired an impassioned argument for the trust fund plan, which would ultimately allocate $10 million a year for housing rehabilitation loans, grants and other home assistance for low- and moderate-income people. A housing task force has said the city faces a shortage of about 17,000 affordable rental units for those earning less than 50 percent of the area median income. The median amounts to about $35,600 for a family of four. The Urban Redevelopment Authority would administer the trust fund under a governing board, according to legislation amended Monday. Council has yet to establish a funding source but has eyed an increase of one percentage point in the city’s realty transfer tax. Some real estate agents have opposed that revenue suggestion. “It’s one more obstacle, one more deterrent to buying a home in the City of Pittsburgh,” Councilwoman Theresa Kail-Smith said of a higher transfer tax. Councilwoman Darlene Harris voiced similar concerns. Both said they support the core goal of strengthening affordable housing. Councilman R. Daniel Lavelle, the housing legislation’s sponsor, said council members were still analyzing options for funding. He would like to have that question resolved by next month, he said. Council President Bruce Kraus has said the body should vote by year’s end on whether to create the trust fund.